If you are a hater of flavors, then back away, hater. I happen to be a lover of fabulous flavor combos. And today I am here to share with you my latest creation. Do you eat turkey and cheese every day? Or PB&J? Is it boring? Yes, it is! here is your answer. 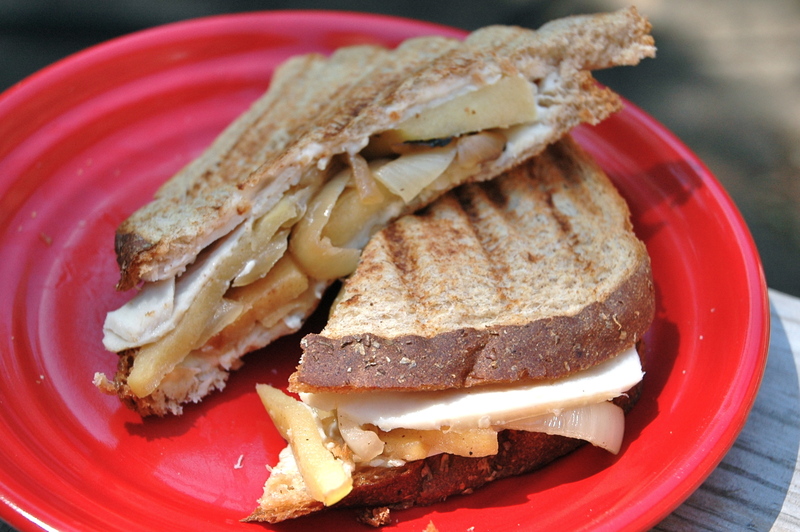 Turkey, brie, apples, and onions heated up on some toasty bread. On Sunday, saute up one onion and one apple. Just slice them both nice and thin, and give ’em a good browning. Then you have them for the week! Then each day for your lunch, spread one wedge of laughing cow blue cheese over two slices of bread. Add a slice of turkey to each of those slices of bread. Then top with a nice little layer of apples and onions. Lunchtime comes, you heat that sucker up in the toaster oven. BLAM. Anyway, I’ve been craving very tasty sandwiches lately, so I’ll let you know what else I come up with. Meanwhile, happy sandwiching! That combo is one of my absolute favorites!! Yum!